Waiting for the tour to start, I was excited that I would soon see the historical interiors of a chateau I had never before visited. 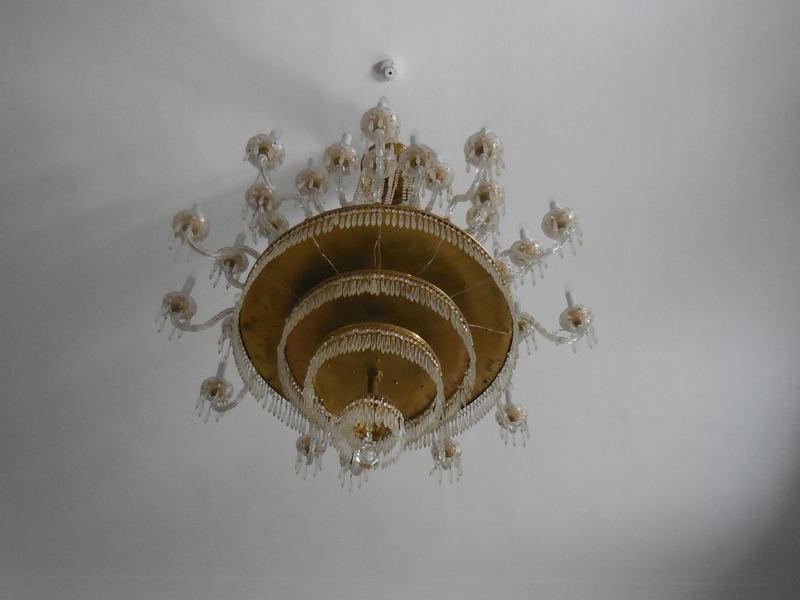 Although Baroque Loučeň (also sometimes referred to as Lautschin) had been open to the public since 2007, I had heard about by chance only in 2015 via an article posted on Facebook. The place sounded magical. I knew I had to make a trip there. And soon. While there are many tours for children, I had opted for the classic tour of the interiors. I was surprised that a settlement at Loučeň had existed as far back as 1223. 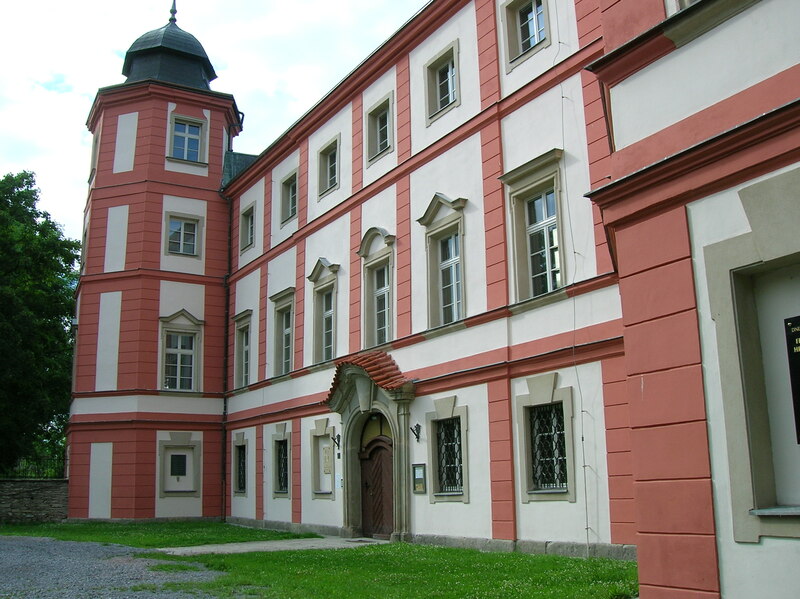 A castle was in the town even during the Middle Ages, but a turning point in the history of Loučeň came in 1623 when Adam von Wallenstein became the owner. That is when the chateau was built in Baroque style, construction taking place from 1704 to 1713. Adam had a famous nephew: Albrecht von Wallenstein had made quite a name for himself in the military. He even held the post of supreme commander of the armies of the Habsburg Monarchy and was a major player in the Thirty Years’ War. The Wallenstein family tree died out in 1752. In 1809 the Thurn und Taxis family came into the picture when Maxmilián Thurn und Taxis purchased the chateau. 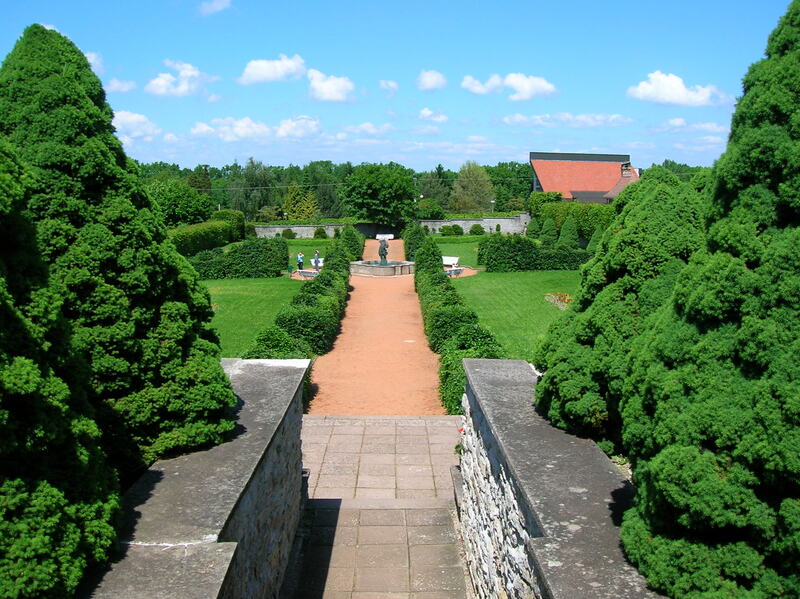 I had become familiar with this dynasty when I had visited Regensburg, where the family had had their main residence. I had toured their elegant palace and distinctly recalled the grotesque figures on the ceiling of the Conservatory, the Brussels’ tapestries in the Large Dining Room and the lavishness of the Rococo and Neo-Rococo Ballroom. The family’s great influence on the postal system had left me in awe. The Thurn und Taxis family descended from the Tasso clan from the 13th century. During the end of the 15th century, Francesco Tasso created the first postal system going from Innsbruck to Brussels. It took a week for the mail to reach its destination. The key to its success was that the rider and horse were changed at each postal station. For his ingenuity, Tasso was given nobility status by Emperor Maximilian I and thus became Franz von Taxis in 1512. Before long the Thurn and Taxis family had the monopoly of the postal services in Central and Western Europe. By the end of the 18th century, the postal system was enjoying great success. The Thurn und Taxis clan had some prominent members, that’s for sure. For example, Rudolf von Troskow established the law journal Právník, the first of its kind in the Czech language. He also created some legal vocabulary that is still in use today. His interests were not limited to law, though. He was a patron of the arts as well. Rilke, times changed at Loučeň, a place many well-known artists and politicians proceeded to visit. Rilke stopped by – not once – but twice. He even dedicated his Notebooks of Malte Laurids Brigge to Marie. Composer Bedřich Smetana lived nearby toward the end of his life and performed on one of the Thurn und Taxis’ pianos. Smetana was a friend of the family; he dedicated his composition Z domoviny to Alexander. Other prominent visitors included Tomáš Garrigue Masaryk, the first president of Czechoslovakia, his daughter Alice, Czech writer Eliška Krásnohorská, musician Josef Suk and American storyteller Mark Twain. Alexander Thurn und Taxis was a man of many accomplishments. He gave his animal trophies to Prague’s National Museum and helped build the first railway in the region. During the tour I would discover the role he played in bringing soccer to Bohemia. The Thurn und Taxis clan would lose the chateau at the end of World War II, when it became the property of the state. In 1945 the Soviet army and locals plundered the chateau. Under Communism the chateau’s history was not rosy, either. It became a recreation center for Ministry of Transportation employees. Later it was turned into a railway trade school. 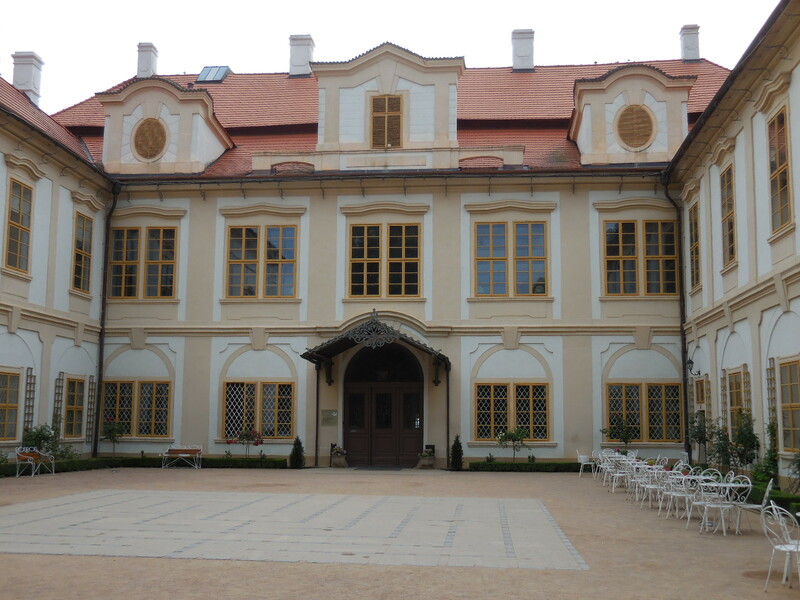 A landmark event occurred when the company Loučeň a.s. took over the chateau in 2000. Even some of the original furnishings were retrieved. Our guide was a descendant of the Thurn und Taxis family. I had never been on a tour led by a member of a family that had had such a remarkable impact on the chateau I was visiting. It was a real treat. In Staircase Hall I was captivated by a large painting of Duino Chateau, a romantic structure perched on a cliff in Italy. The young man’s parents were there now, he said. The place had been the Thurn und Taxis’ property for centuries. Rilke had written his Duino Elegies there. 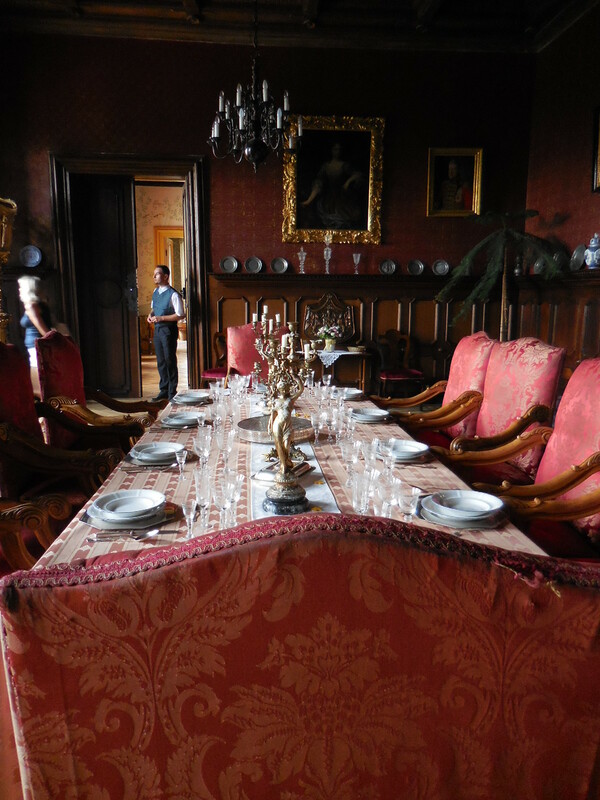 I wanted to sit in the red, plush chairs at the dining room table and stare at the exquisite porcelain service. Overall, there were 600 pieces, but only a portion of them were on display. The fancy gold candlesticks got my attention, too. In the Chinese Salon I was impressed with the big Chinese vases, so colorful with superb designs. The white wallpaper featured pink flowers and green leaves and had a sense of fragility and intimacy to it. In the Prince’s Bedroom I noticed a photo of Prince Alexander with his four cats, three of whom slept on the bed with him. Curled up on the bed were three stuffed animal cats. I thought that was an interesting touch. My late cat had almost always slept on my head during almost 15 years, and I thought of how much I missed him. I wondered what my five-year old cat was doing at that moment. She liked to sleep at the foot of the bed. I didn’t think I could live without cats in my life. Maybe Alexander had felt the same. In the servant’s bedroom I saw something that really surprised me. At first I did not understand why there was an iron next to replicas of old banknotes. Then the guide explained. The servant ironed the prince’s money so that it would not be crumpled. That was not all. The servant also ironed the prince’s newspaper to prevent the color from fading and to keep it from getting dirty. In the hallway I saw a vacuum from the 1930s and red buckets on one wall in case a fire would break out. A picture of the Loučeň soccer team from 1893 also hung in the hall. That team played in the first official soccer game in Bohemia, thanks to Alexander’s interest in the sport. An avid fan of classical music, I have always enjoyed visiting the music salons in chateaus. This time was no different. I tried to imagine Smetana performing on the piano in the room. On the piano was a red box of Mozartkugeln truffles. The music sheets were turned to Concertino for violin and piano by Leo Portnoff, who was born in Russia during 1875 and emigrated to the USA in 1922.) I wondered if Alexander had played the violin accompanied by Marie on the piano when performing this piece. 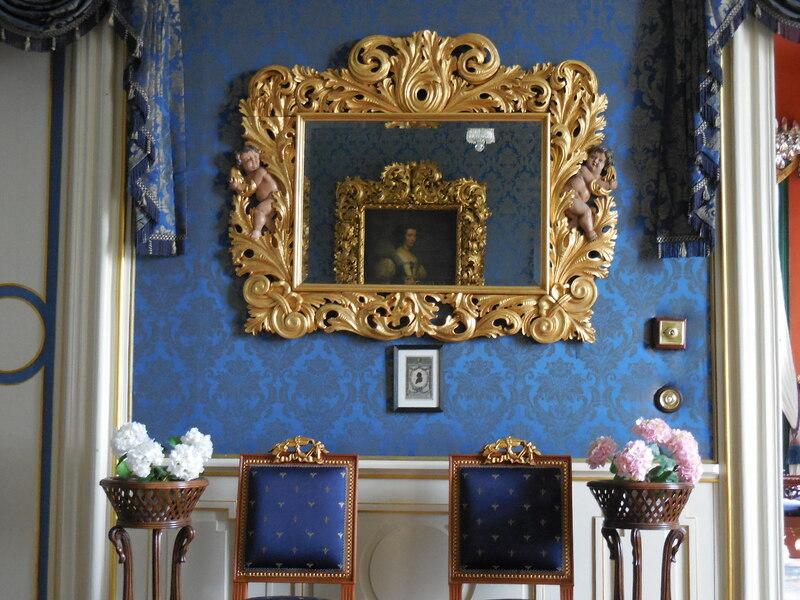 The Princess’ Salon was decorated with books by Rilke and an upright piano from the 18th century. The view of the park from the window here was very romantic and picturesque. There were 10 mazes and 11 labyrinths in the park. I would have to check it out later, I told myself. I loved the bright green painted walls and a nook in one part of the room. I wanted to relax and read, seated in that nook, losing myself in a mystery or art catalogue. 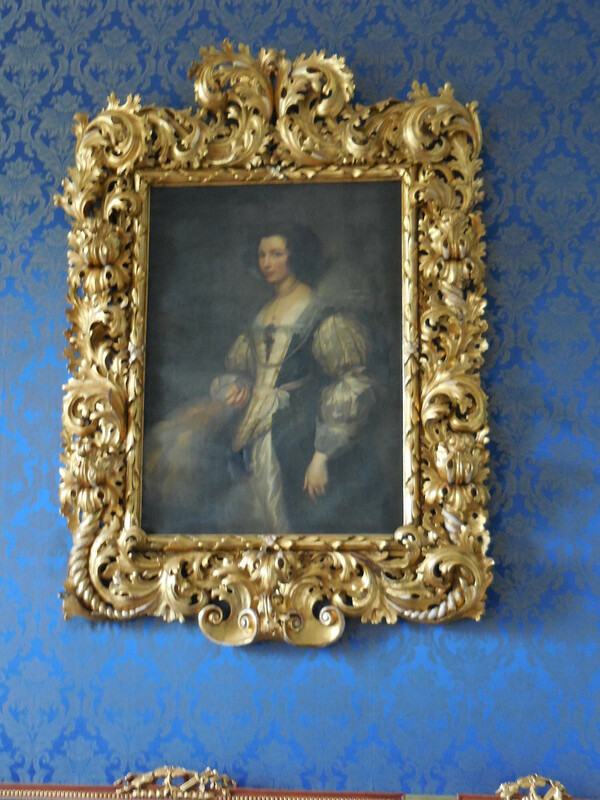 In the Princess’ Bedroom I saw her ravishing pink-and-cream wedding dress, which she had donned at age 40. I marveled at how young she looked in photos. Crowns and lions adorned the light blue wallpaper. 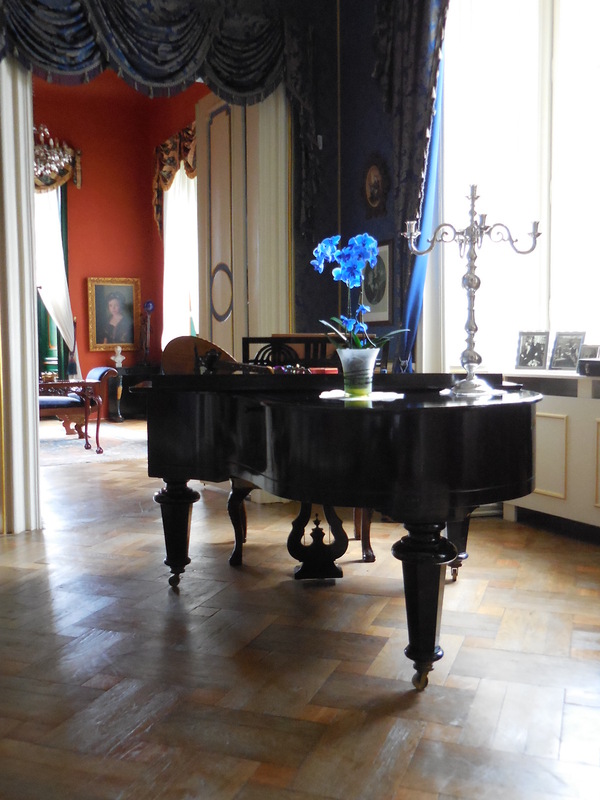 A piano made by Rudolf Stenhamer in Vienna stood in the room, too. I admired the richly carved patterns on the front and back of the bed. I also was interested in the personal items that had belonged to the princess. On display were fans, a crocodile handbag and beautiful necklaces as well as a jewelry bag. The Oriental carpet was a nice touch, too. The Children’s Room came next and then a small classroom for Thurn und Taxis children. It was very plain. There was a small bench for two students with small blackboards. On the desk were two books called Histoire de la Revolution Française. In the Church of the Assumption of the Virgin Mary there was a real treat. 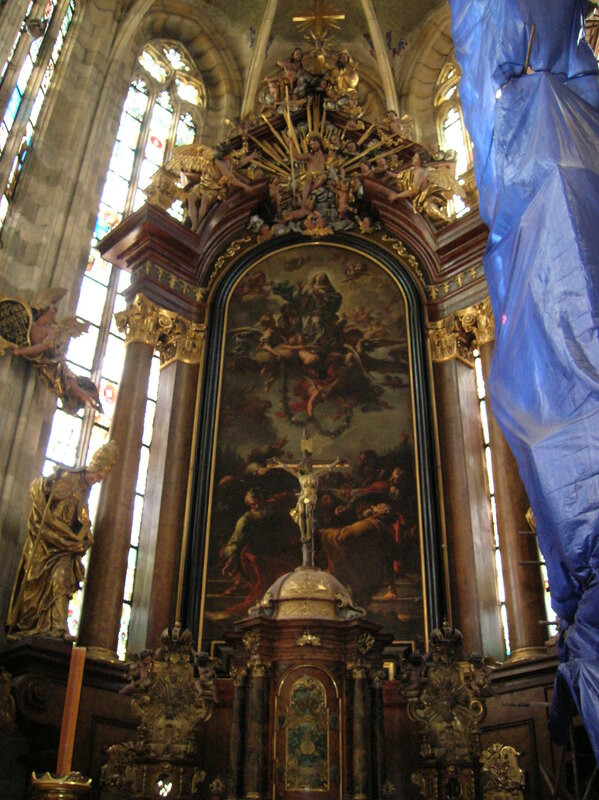 The artwork over the main altar was made by my beloved Czech Baroque painter Petr Brandl. I recalled his altar paintings in the cathedral at Sedlec, which I had visited earlier that year for what must have been the fourth or fifth time. Still, his work never failed to amaze me. The library consisted of a gallery and ground floor. One of the books prominently displayed was an English version of a fairy tale by Princess Marie – The Tea Party of Miss Moon. I would have been interested in reading it to get a sense of the princess’ writing style, but it was not for sale in the chateau shop. The most valuable book was the huge chronicle of the Thurn und Taxis family. Another enormous volume on a table tackled the theme of the romantic Šumava region in the Czech lands. The room was not without its distinguished family portraits, either. I walked through the park a bit and then made my way to Nymburk, a town closely associated with my favorite Czech writer, Bohumil Hrabal. In Nymburk I did not have much time for sightseeing, though. 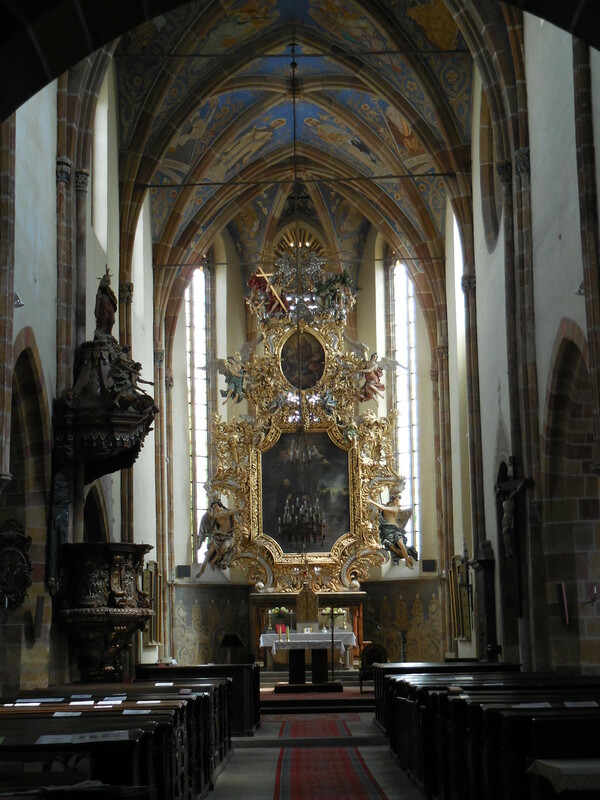 I peeked into a Gothic church and had lunch before heading back to Prague, more than satisfied with the trip’s outcome. 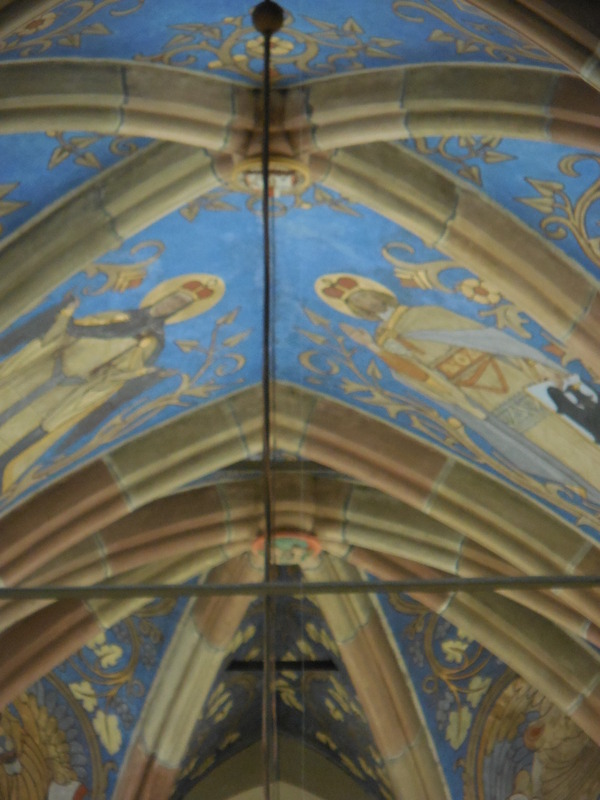 The vaulting of the Church of Saint Lawrence in Vysoké Mýto was spectacular. This time I traveled with UNISMA in a small group of 17 participants to see some wonders of east Bohemia. Two wooden churches and the town of Vysoké Mýto were a few places on the itinerary. I had only been to the bus station in Vysoké Mýto long ago. I had not imagined that there was anything interesting in the town. 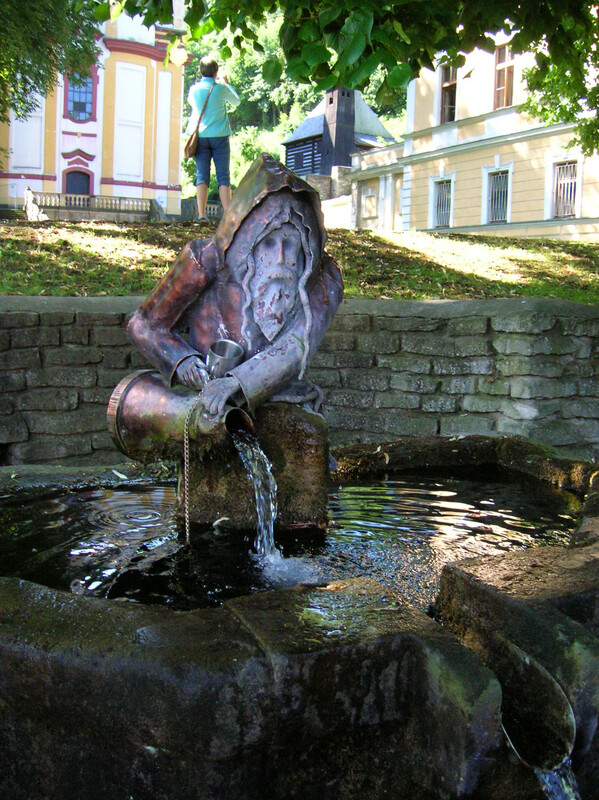 The fountain with Saint Francis in Vraclav. 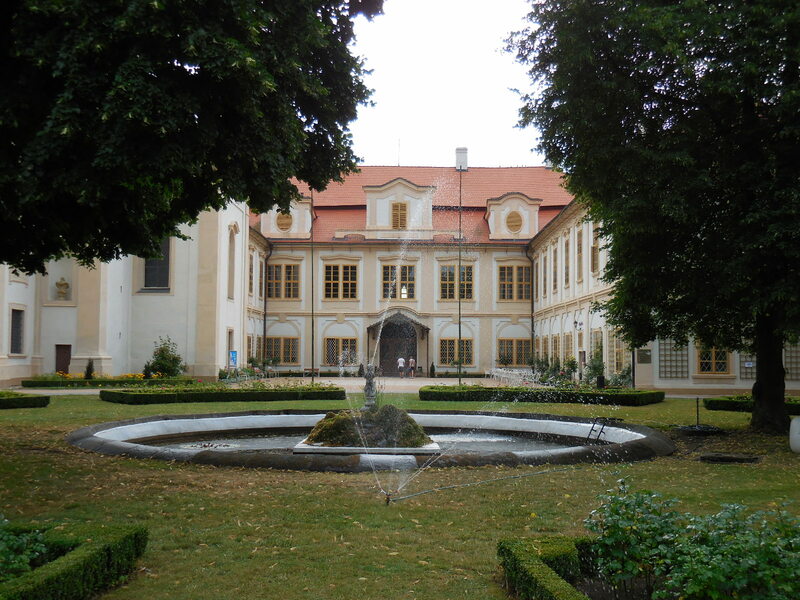 First we visited the Baroque complex of the former spa town of Vraclav. A figure of Saint Francis poured water into a fountain. The Church of St. Nicholas featured 28 Baroque statues made of wood and polychrome plastic by an unknown artist before 1740. It was thought that the creator had been a pupil of Matyáš Bernard Braun, an Austrian sculptor who had worked extensively in the Czech lands and a leading representative of the Baroque style. Three of Braun’s sculptural groupings grace the Charles Bridge in Prague, and he also created a tomb in St. Vitus’ Cathedral. 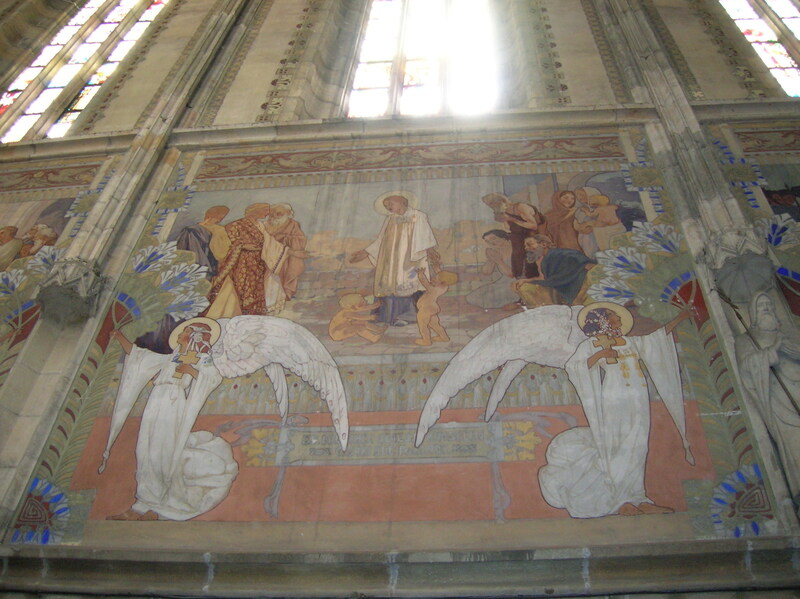 His renditions can be seen throughout churches, palaces and parks in Prague as well as at the former hospital Kuks, the monastery Plasy and the Duchcov Chateau, among other places. The statues had been moved to the Church of Saint Nicholas from a pilgrimage route that had led to a former monastery. At the beginning of the 17th century a chapel and a hermitage were built on the site. From 1724 to 1730 the Baroque church was constructed there. 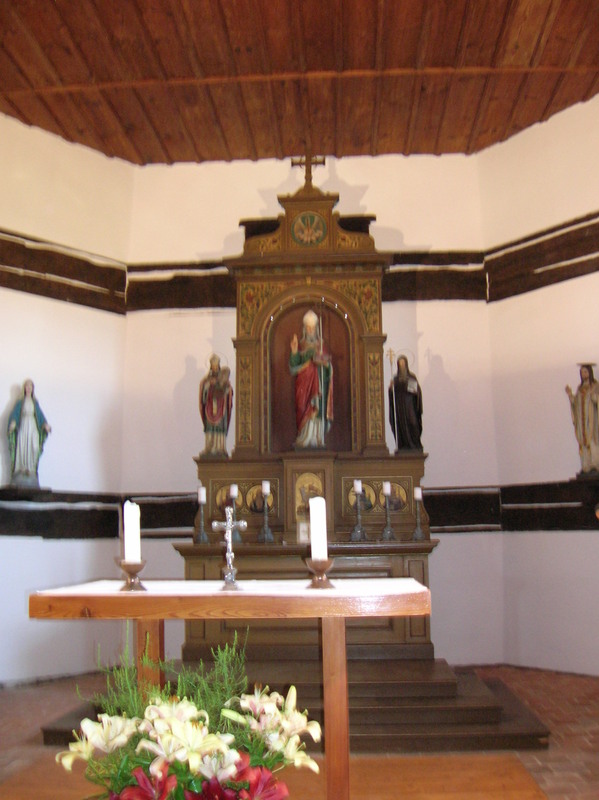 A spring appeared at the chapel under the entranceway, where a statue of Saint Nicholas dominates. A spring flowed underground around the nave from both sides. This former pilgrimage site and spa deteriorated at the end of the 18th century. It was not reconstructed until the 20th century, 1976 to 1986. 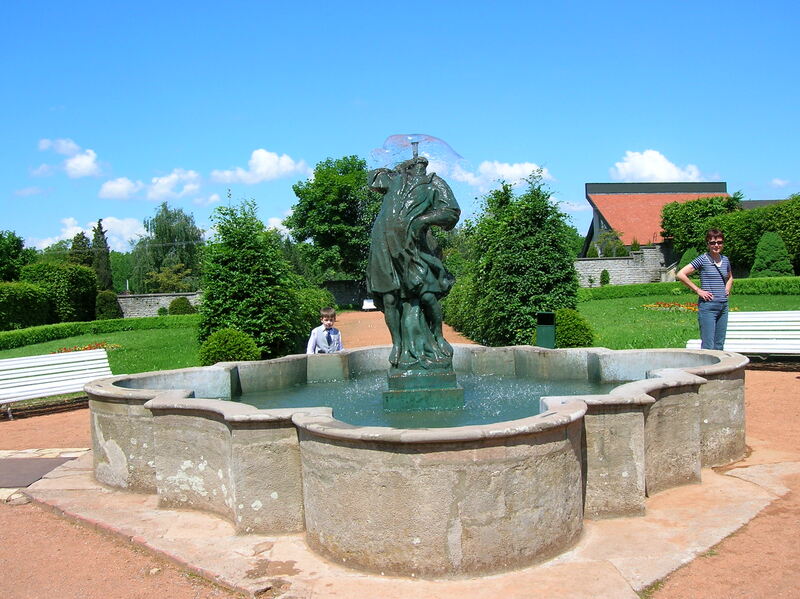 At the end of the 17th century and the beginning of the 18th century, a well-known spa had been located nearby. However, its popularity dwindled by the end of the 18th century, and the spa became dilapidated. By the second half of the 19th century, it had been abandoned and for the most part forgotten. 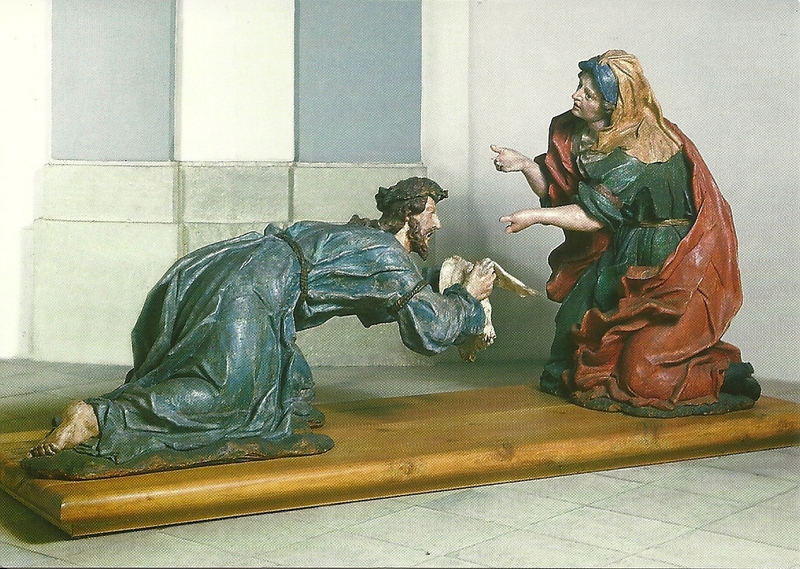 The statues of biblical scenes were expressive and dramatic. I especially loved the details in the depictions. In Ecce Homo I noticed the detailed teeth and tongues. They looked so realistic. 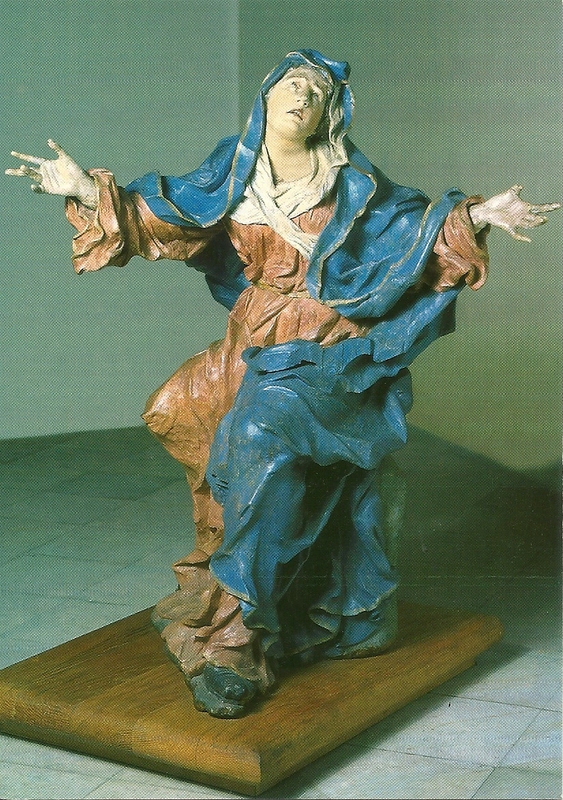 One statue showed the Virgin Mary with a pleading expression and what seemed to be fluid hand gestures. I also liked her flowing drapery. In another statuary grouping I took note of the real-looking feathers in the helmets. In yet another sculpture Jesus Christ’s thumb looked so life-like. In one statue of Christ, I admired the artist’s rendition of Christ’s veins on his feet. The detail of this unknown artist was more natural than that in Braun’s sculptures. The Baroque artworks were imbued with strong emotion. Beautiful chandeliers complemented the statuary. There was also a hermitage next to the church. It dated back to 1690. Pilgrims had come here to meditate. There was a legend concerning the bell of the hermitage. If a female rings it while thinking of her love, she will marry him within a year. We trekked uphill to a former fortification from the 12th century. 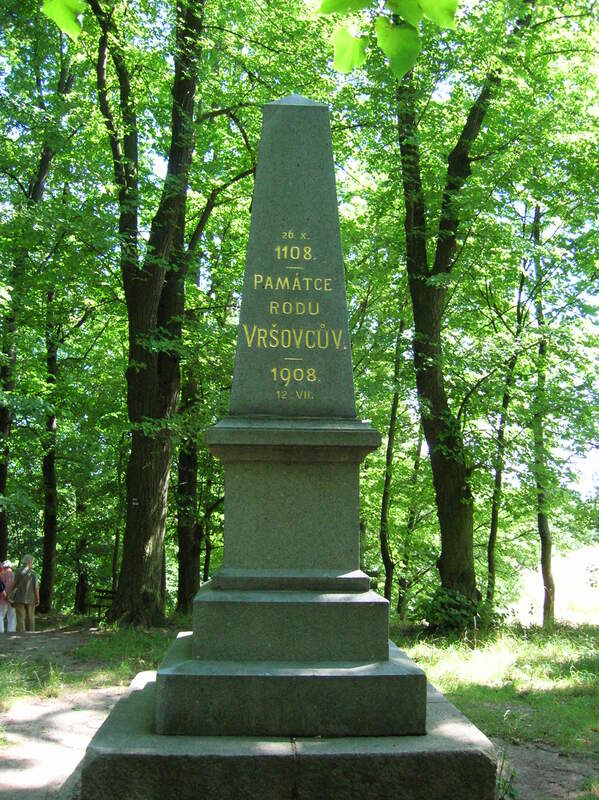 Now a monument from 1908 recalling the murdering of the Vršovec clan in 1108 is located on the site. Our guide explained to us why the Vršovices were killed. The tale fascinated me. At the beginning of the 12th century during the reign of the Přemyslid dynasty, scheming and intrigue prevailed. In 1105 an ambitious Moravian Přemysl named Svatopluk overthrew reigning Bořivoj, and many of Bořivoj’s former supporters switched sides. While Svatopluk was busy doing battle, Mutina took over the administrative responsibilities of the state. Mutina was a prominent member of the Vršovec clan. 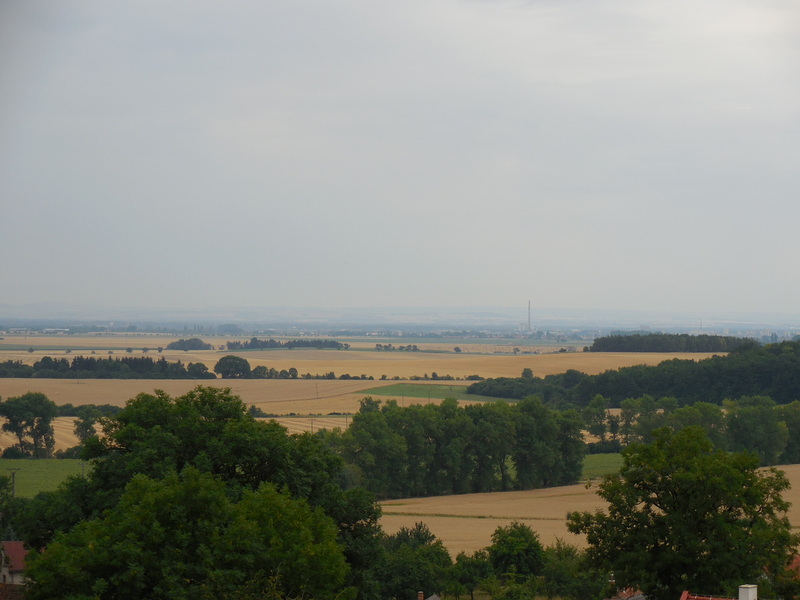 The Poles along with Bořivoj invaded the Czech lands, and Mutina did not seem too enthusiastic about fighting them. When Svatopluk returned from war, Mutina was called to the castle in Vraclav, the seat of Svatopluk, who accused Mutina of having ties with Bořivoj. 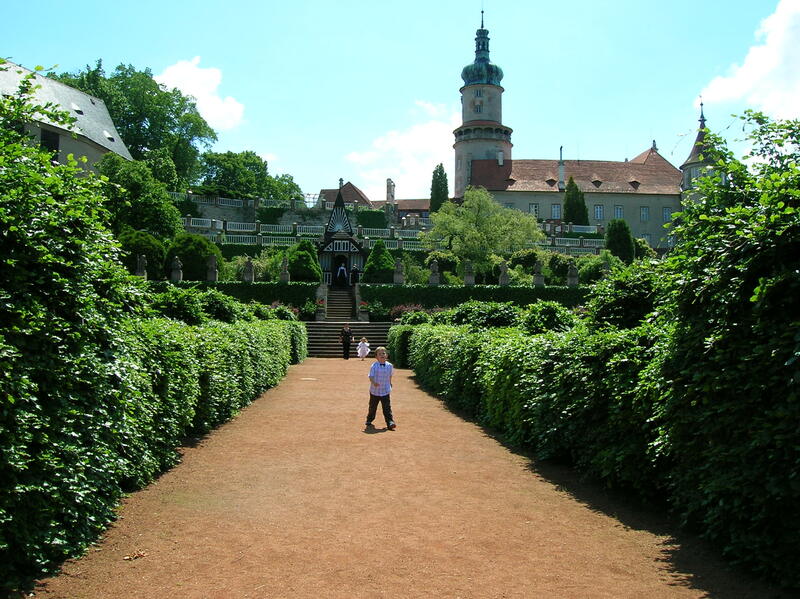 Many members of the Vršovec clan were murdered there in an act of bloody revenge. However, the entire family was not wiped out. The following year one member of the Vršovec family murdered Svatopluk. I recalled that Bohumil Hrabal had referred to this historical event in one of his books. (The legendary scribe Hrabal was my favorite Czech writer.) I was intrigued by such historical tales. That information alone made the trip worthwhile for me. And I loved the way the guide knew all the information by heart. I could hardly believe that she was able to keep so much information in her mind. It just spewed out of her mouth as if she were an encyclopedia. 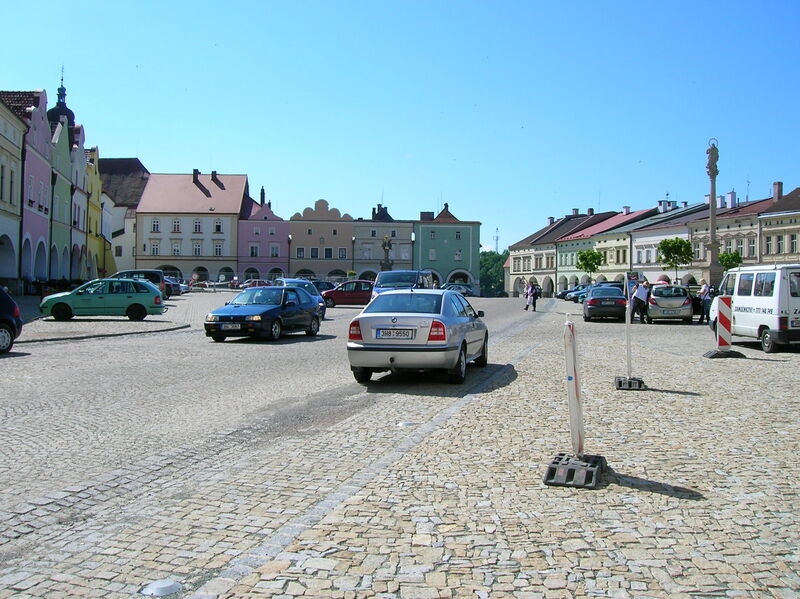 Next stop: Vysoké Mýto, a town only six kilometers from the Baroque complex, with a population of 12,000 residents. Vysoké Mýto’s history could be traced back to the Stone Age. The town was created in 1262 by Czech King Přemysl Otakar II. In 1307 it became the property of Czech queens. 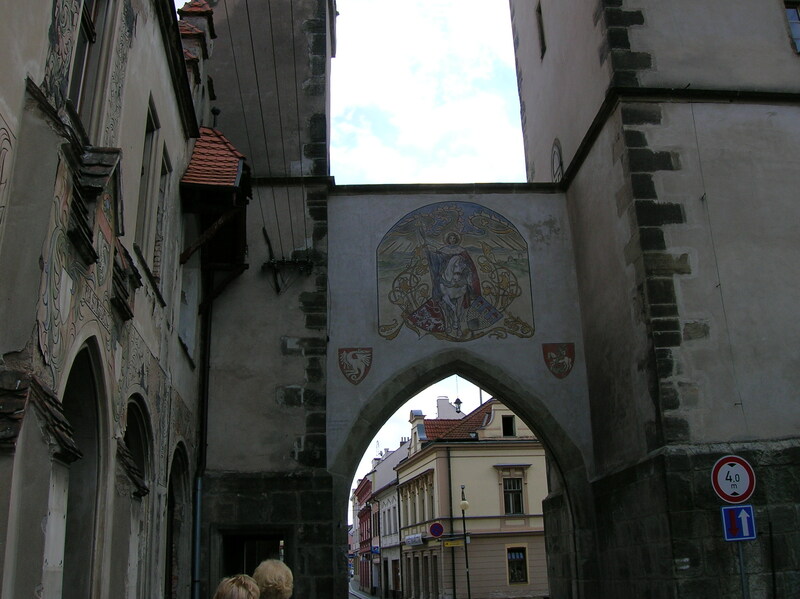 We walked by the Prague Gate with rich decoration that went back to the Middle Ages, to the 14th century to be precise. A painting of Saint George fighting the dragon adorned the gate. 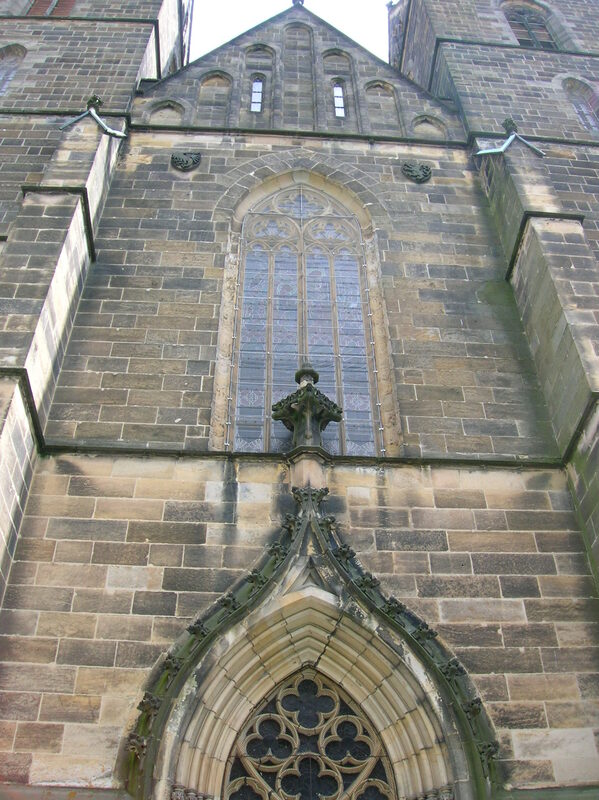 A tower with a broken Gothic portal stood nearby. The main square, also founded by King Přemysl Otakar II, is the biggest in east Bohemia at a width of 152 meters and a length of 152 meters. Forty-seven houses surround it. The tour guide told us that the term Kujebáci or Kujebas enjoyed popularity here. The town’s sports’ teams were even called the Kujebáci. I found the legend about this nickname particularly intriguing. 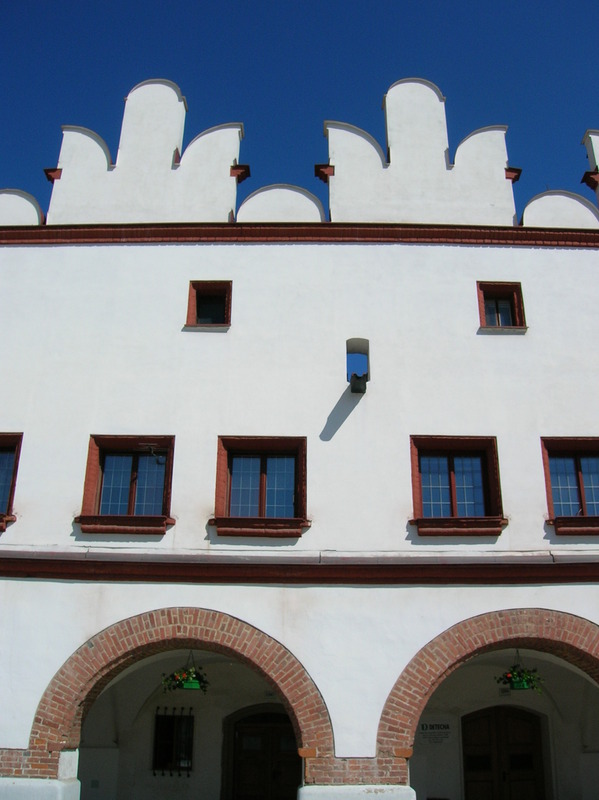 Many centuries ago, the emperor was slated to visit Vysoké Mýto. The townspeople prepared a huge feast, serving trout. However, the emperor did not show up, so the residents all had the delicious fish for themselves. The following day, though, the emperor did arrive in Vysoké Mýto. The inhabitants fed him trout, and when he remarked that the fish was excellent, a townsperson named Kujeba said, “If you think the trout is good today, you should have tasted it yesterday.” The emperor asked the man his name. “Kujeba,” he replied. The emperor declared, “Then from now on I will call the residents of this town Kujebáci (the Kujebas).” While this term had once been used as a swear word or had referred to a stupid person, the Vysoké Mýto inhabitants were very proud of the legend and asserted that the name stood for someone who is wise. The differing Kujebáci connotations reminded me of the controversy about Josef Švejk, the seemingly incompetent yet loveable Czech soldier fighting for Austro-Hungary during World War I in Jaroslav Hašek’s satirical, antimilitaristic, mammoth novel, The Good Soldier Švejk. Whether Švejk was really stupid or clever, exhibiting passive resistance, is open to debate. 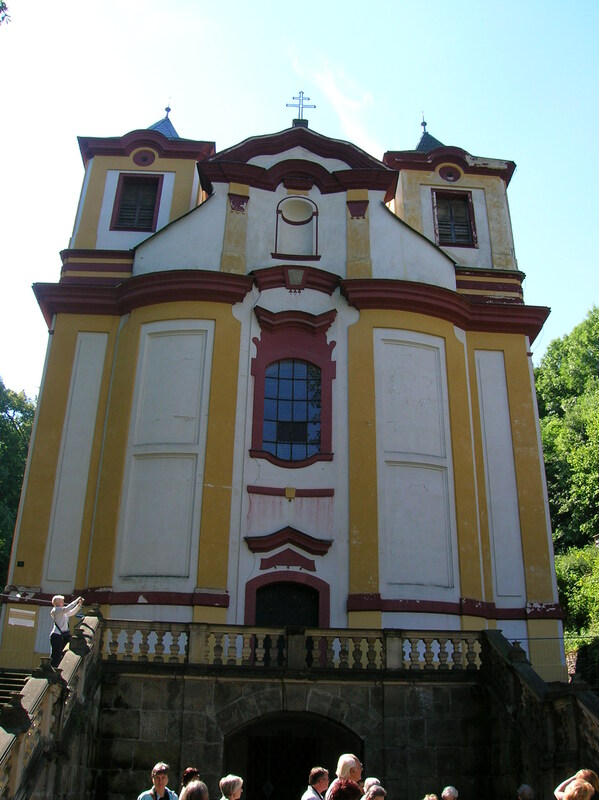 In Vysoké Mýto we visited the Church of Saint Lawrence, a sight to be remembered. It was probably as old as the town itself, hailing from the 13th century. Several fires plagued the town and the church, in the 15th, 18th and 19th centuries. 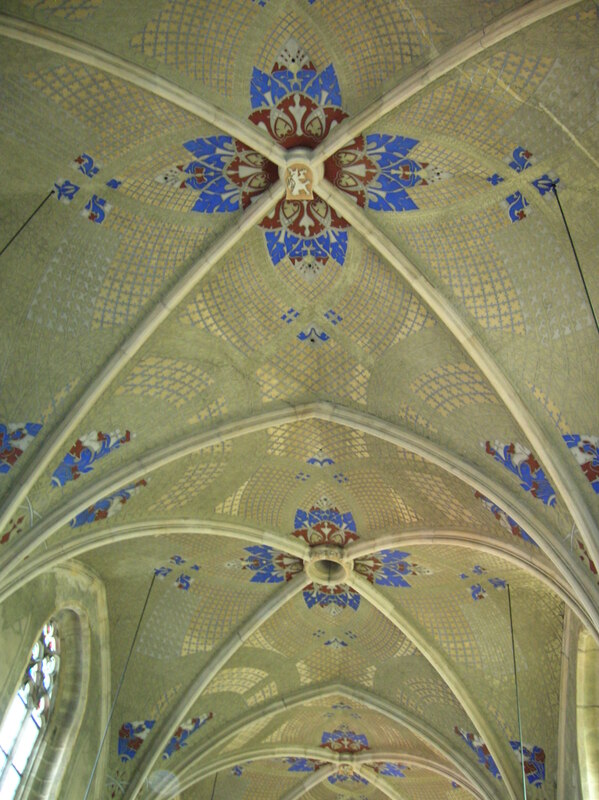 Consisting of three naves, the church boasted vaulting from 1525 at a height of 21.3 meters. The five-storey tower is 67 meters high. Now it looks as it did after Neo-Gothic reconstruction from 1892 to 1899. There were 10 Neo-Gothic altars and Neo-Gothic wall paintings. The architects of the repairs were František Schmoranz and Josef Mocker. Schmoranz’s résumé included doing Neo-Gothic restoration on Žleby Chateau. Mocker had helped restore many structures in Prague, including the Old-New Synagogue, Prague Gate and St. Vitus’ Cathedral. He had even done some work on Prague Castle. His restorations out of Prague were just as impressive, including Saint Barbara’s Cathedral in Kutná Hora, Karlštejn Castle, Konopiště Chateau, Křivoklát Castle and Saint Bartholomew’s Cathedral in Pilsen. 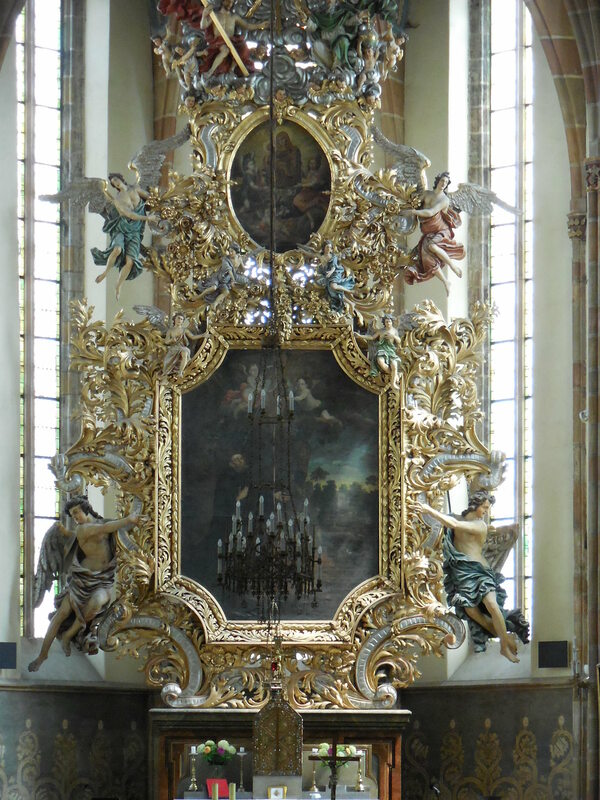 I was excited to see this church because the painting of the main altar, “The Assumption of the Virgin Mary,” was the largest painting Baroque guru Petr Brandl had ever created, forged in 1728. I recognized his self-portrait in the figure of Saint John. I had admired his creations in many museums, the Prague Chapel of the Holy Mountain pilgrimage site, Jindřichův Hradec Chateau and in numerous churches. A Late Gothic Madonna – the Vysoké Mýto Madonna – hailed from before 1500. I also marveled at a pewter baptismal font from 1499. Tombstones in the church dated from the 14th to 16th centuries. One of the bells was made in 1466. 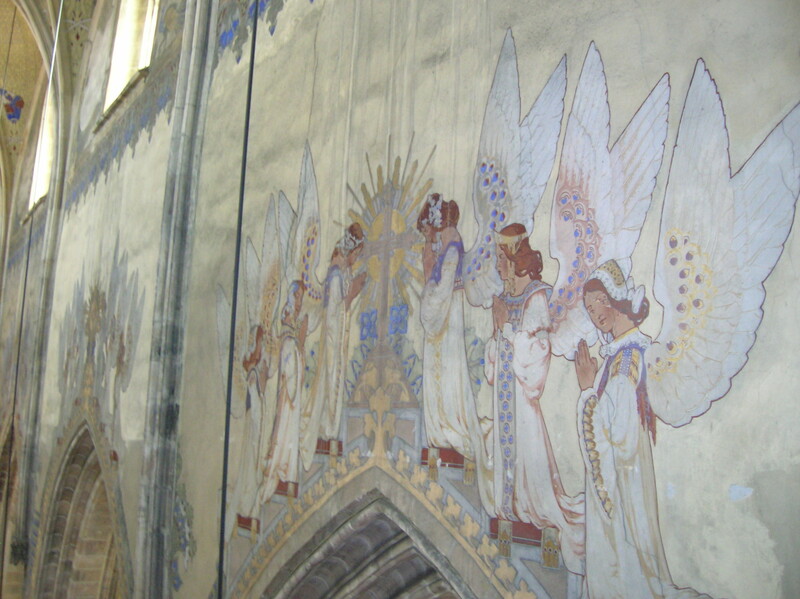 I loved the Secession wall paintings, too, especially the angels fluttering near the choir loft and the peacock designs. In the windows motifs included stylized plants. I took note of the Fleeing from Egypt scene at the altar of Saint Joseph. Somehow the Baroque main altar painting and Art Nouveau wall and altar decoration complemented each other. That would not be the most fascinating place I visited on the trip, however. 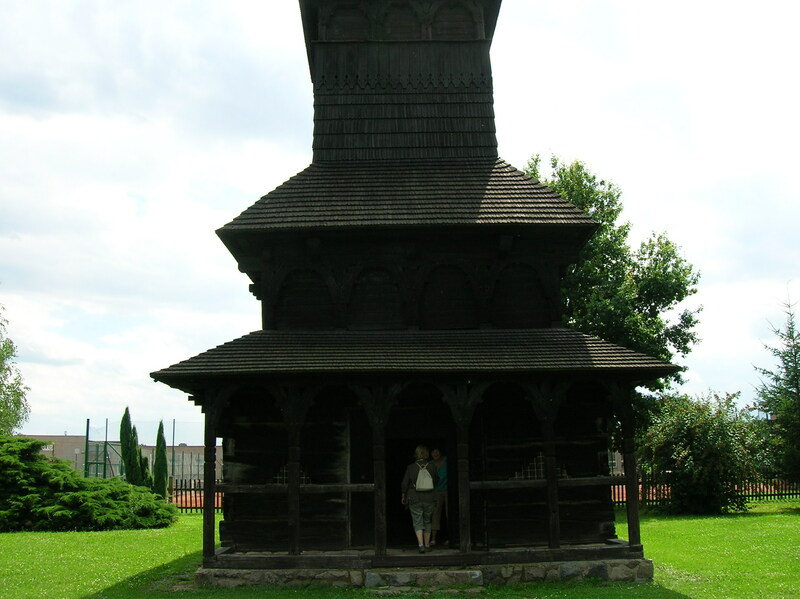 We also saw the romantic wooden Church of All Saints in the village of Dobříkov. 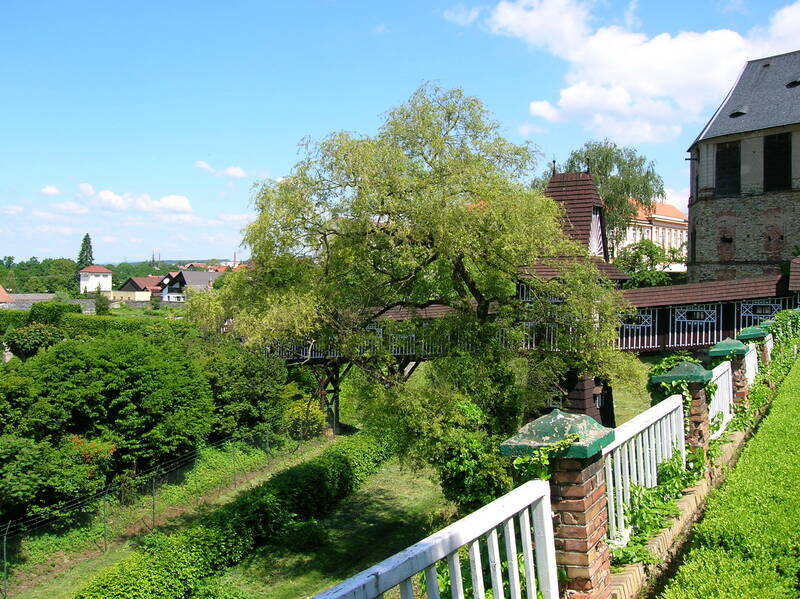 Originally located in the Podcarpathian Rus region that is today part of the Ukraine, the church was moved in four train wagons to this village in east Bohemia during 1930 thanks to the initiative of Czech statesman Václav Klofáč. 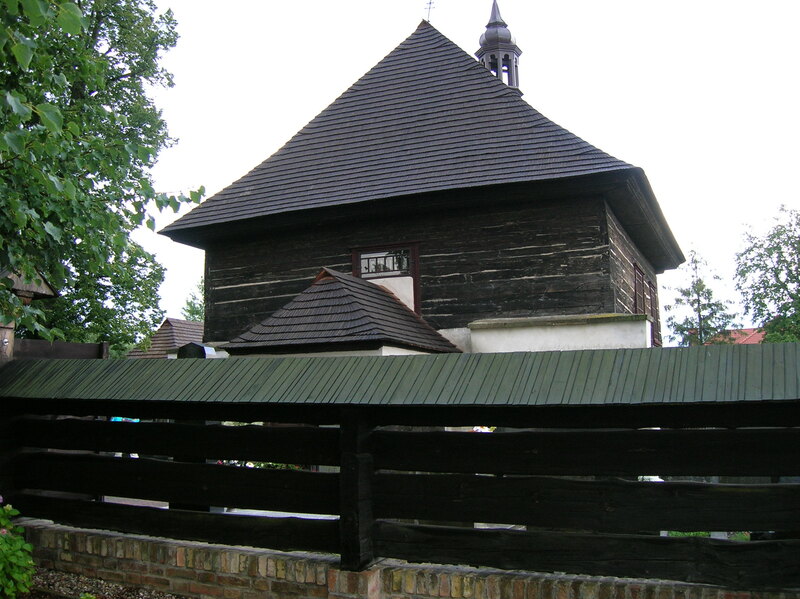 Dating from 1669, the Church of All Saints first moved – 200 years after its creation – to a village situated where the Romanian-Ukrainian border is now located. Then in 1930 it was transported to Dobřikov. 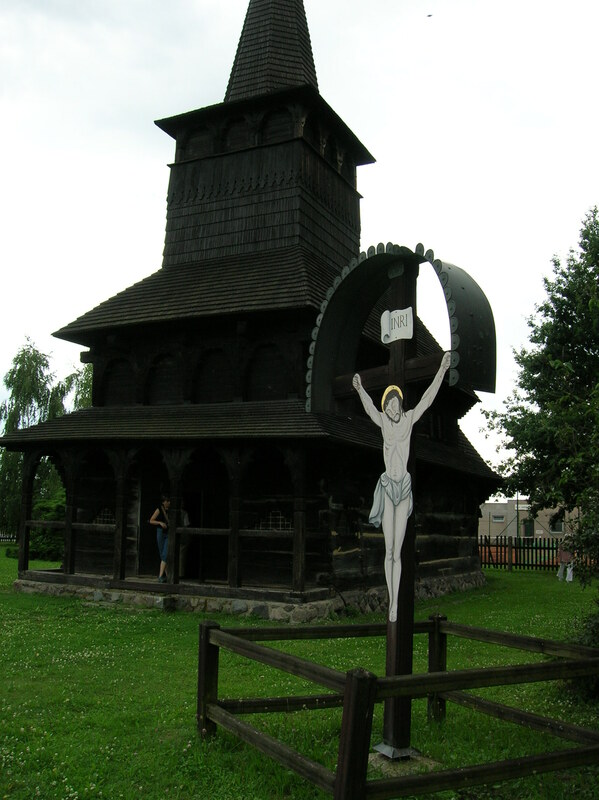 Made of all wood, the church was small, with only one nave, 15 meters long and 6 meters wide. Above the entrance front was a 17-meter high tower with a spiked roof. The icons inside the church amazed me. I felt as if I were in the Russian Museum in Saint Petersburg, only this was a much more intimate experience than gazing at artwork in a large building. 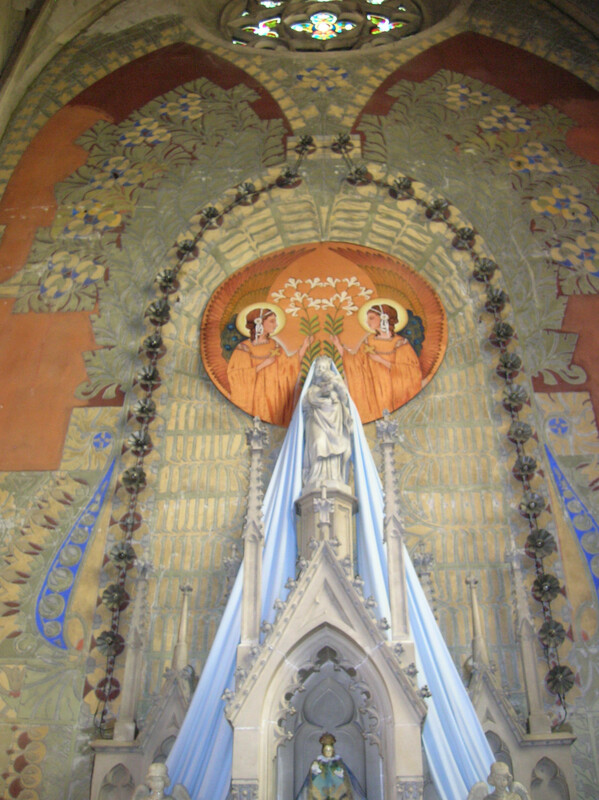 The icons in the presbytery hailed from the 18th century. The icons on the sides were even older, dating from the 17th century. All the gold on the icons was overwhelming. On the sides the 12 Apostles appeared in groups of two. Mass was still said here, every other week. I found it ironic that the church was situated next to a golf course. Wooden churches had been symbols of poverty in villages while golf courses were symbols of wealth. Seeing the two side-by-side was incongruous. The church reminded me of my visit to Broumov a few years earlier, when I visited the Church of the Virgin Mary, the oldest preserved all-wood structure in Central Europe. There had probably been a wooden church on that site as far back as the 12th century, although the church was first mentioned in writing in 1383. It consisted of a single nave with a pyramid steeple and displayed stunning artwork. Who was Václav Klofáč? I asked myself. 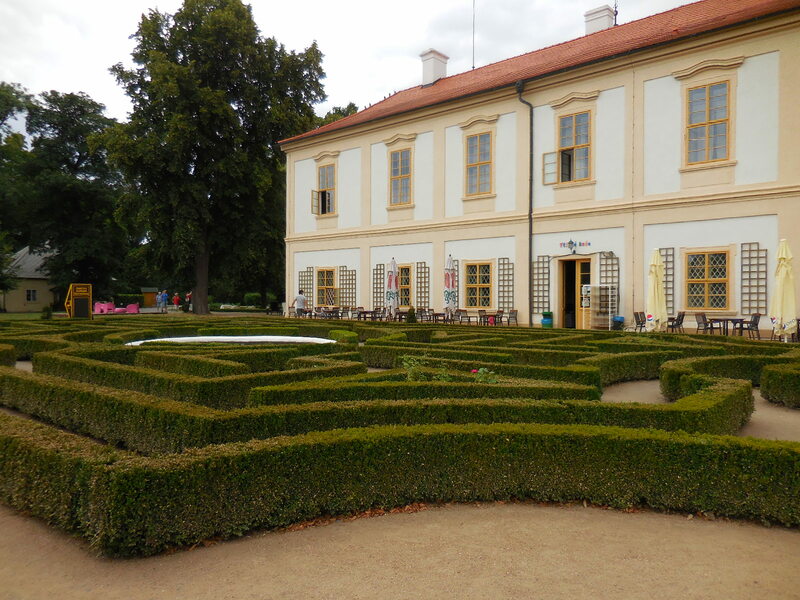 I would find out when we walked to a small museum dedicated to the Czech politician. It was run by Klofáč’s granddaughter, a spunky, energetic 94-year old. I wondered if I would live so long, and if so, if I would be blessed to be so lively and communicative at such an elderly age. Klofáč, who was born in 1868 and who died in 1942, had been a Czech journalist and politician who had led the Czech National Socialist Party and had worked in the Austro-Hungarian Parliament and later in Czechoslovakia’s Parliament. During World War I he was taken prisoner. 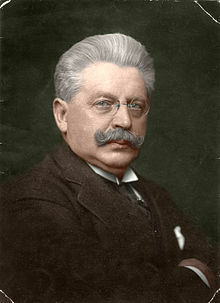 After World War I, in 1914, Klofáč was wrongly arrested in Dobříkov and like other Czech heroes, branded a traitor because he had worked in the resistance movement during the war. He was freed in 1917. During 1918, when Czechoslovakia was created, he became the nation’s first Minister of Defense and also served as a senator for a long time. The Czech National Socialist Party, which he co-founded in 1898, was very nationalistic and abhorred Marxism. They sought to foster relations with Americans, for example. I loved the photos of Klofáč accompanying first Czechoslovak President Tomáš G. Masaryk. If I could meet anyone who was alive or dead, I would probably choose to meet Tomáš G. Masaryk. If I could go back to any time period, I would travel back in time to Czechoslovakia’s First Republic, which lasted from 1918 to 1939. I would have wanted to see the First Republic from 1918 to 1932, before Adolf Hitler came to power in 1933 and the trends of Nazism, Communism and Fascism invaded the country. Masaryk was one of the people I admired the most. During the First Republic minorities had rights, and all citizens were treated equally. Freedom of the press and universal suffrage existed. Elections were democratic. During Masaryk’s first term from 1918 to 1920, he eased Czech-German tensions. He also stayed in contact with the people. The country had a strong currency and experienced economic success. 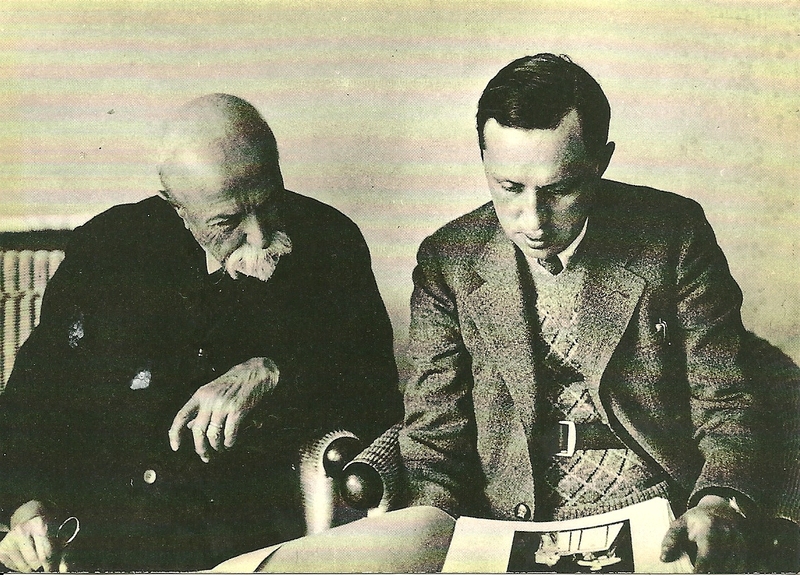 One of my favorite authors, Karel Čapek, prolific in many genres, was a good friend of Masaryk and even wrote a book about his conversations with him. We saw another wooden church, too – the Church of Saint Nicholas in Veliny, which was a prime example of 18th century folk architecture. It was built in 1752 on the site of a former wooden church that hailed from 1576. The timbered church looked so romantic. The one-nave structure had a three-sided presbytery and a flat, wooden ceiling. The choir loft was supported by wooden, carved columns. The interior was sparse, nothing like the Church of All Saints and its dazzling golden icons. The pulpit hailed from 1903. The bareness of the interior emphasized it as a symbol of poverty. I personally liked the interior of the Church of All Saints better, but perhaps a wooden church should be sparsely decorated. It seemed appropriate for to portray such modesty. 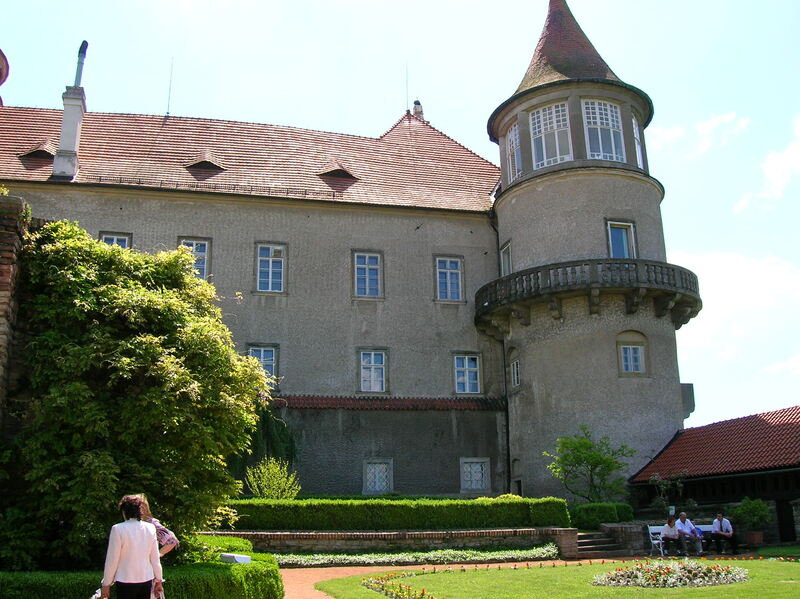 Our last stop was picturesque Zámrsk Chateau with its three-floor, polygon-shaped tower. It was first mentioned in writing as a fortress in 1469 and various owners did restoration work. It burned down in 1924 but was repaired soon thereafter, during 1925 and 1926. There are still remnants of its Gothic days, though, in the east wing and in part of the masonry of both wings. In 1945 it became state property. Under Communism it served as an educational center for youth, and from 1960 to the present it has been the home of regional archives. We were not allowed to go inside, but the exterior was impressive. The most tragic story concerning the chateau occurred a day after the Nazis took control of the Bohemia and Moravia, on March 16, 1939. 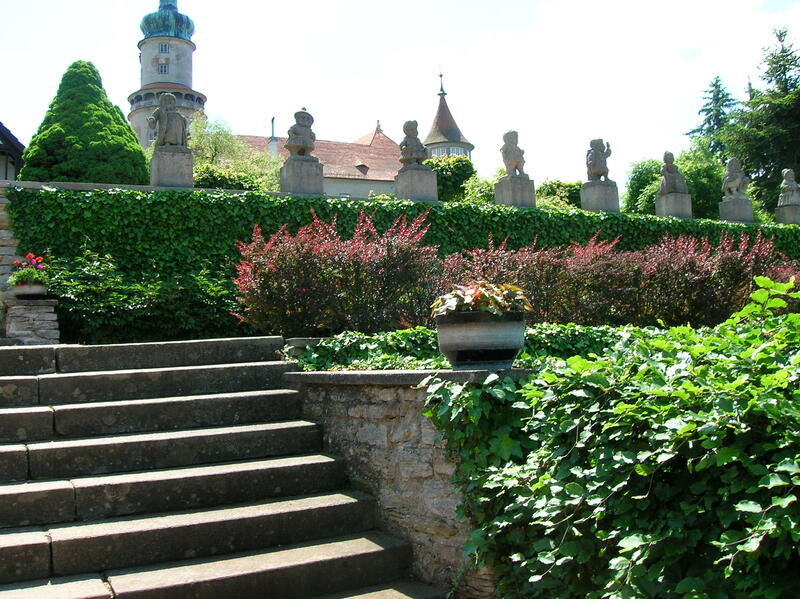 At this time Jewish Arnošt and Truda Bondy were the beloved owners of the chateau. Aware that horrific times were beginning, on that day they committed suicide. Arnošt shot his wife and then himself. He fell into the river, where his body was later discovered. Stories like this always brought to mind the reality of living in that period, and I thought of how I did not think I would have been able to survive living under Nazism, even though I am not Jewish. Living under Nazism and Communism was something I could not even fathom, something too disturbing to ponder. Jan Blažej Santini-Aichel, of Czech and Italian origin, was considered to be one of the architects contributing to the chateau. His Baroque Gothic style sparkled in a church in the Sedlec area of Kutná Hora and at the pilgrimage church of Green Mountain. His staircase at Plasy Monastery was a gem. A few other sights to which he had contributed included the Kolovrat Palace in Prague’s Lesser Town and the Karlova Koruna Chateau. Our tour soon ended, but during the ride back to Prague, our excellent and eloquent guide passed around booklets about Slovakia’s wooden churches, some of which I had visited about 14 years earlier. I remembered how my fascination with wooden churches began when I saw the wooden church at Bardejovské Kúpele in east Slovakia. She also let us peruse a book about Václav Klofáč. I was more than satisfied with the tour. I had discovered places I have not known existed, such as Vraclav, Dobříkov, Veliny and Zámrsk. 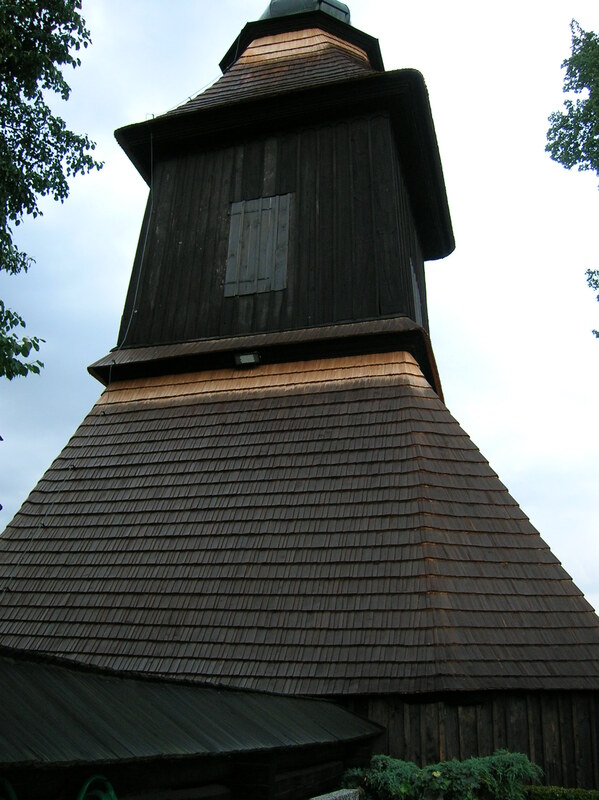 I had visited two wooden churches and had become acquainted with some of the splendor of Vysoké Mýto. I had also learned about the Czechoslovak statesman Václav Klofáč, who had greatly contributed to the democratic First Republic. I had been impressed with the historical tales, such as the slaughtering of the Vršovec clan. I was happy with the tour itself. We had an amazing guide. I had met many interesting people on the tour as well. I came back to Prague richer in my knowledge of the country I loved so much, eager to describe my discoveries to English-speakers who planned on visiting the Czech Republic someday and to Czechs eager to see more sights in their homeland.